An Ayrshire bull stares down onlookers at the Dennis Himsel farm near Paoli. Paoli farmer Dennis Himsel says he always locates his bull before entering a feedlot or pen with his cows. In this case, Himsel spots the bull staring at him as he climbs over a fence. 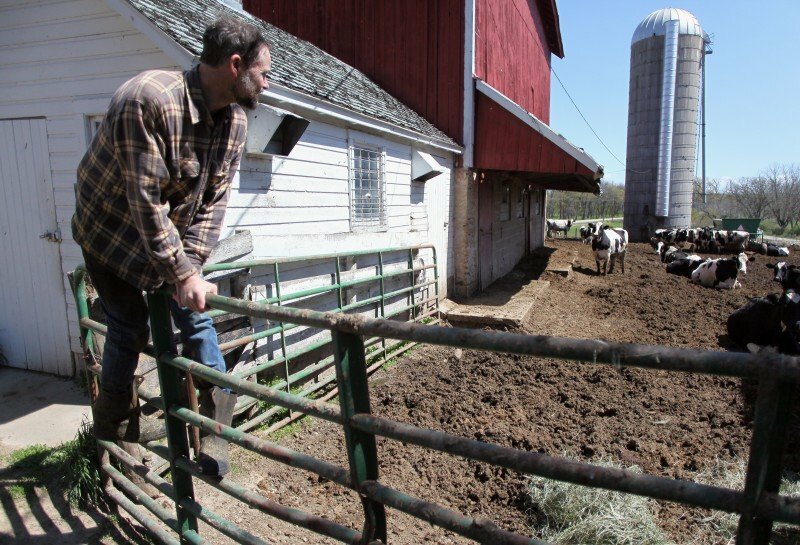 Verona farmer Curt Herfel stands near an animal pen where a bull mauled him 13 months ago, breaking eight of his ribs, two vertebrae and shattering his femur. This article first appeared in Sunday's State Journal. It took mere seconds for a bull to kill Avoca farmer Alfred Albrecht. The 78-year-old Albrecht was opening and closing a pasture gate for his son, Danny, who was using a skid steer to feed hay to his cattle on April 1. In the short time it took Danny to make the quick drive to the barn for another bale of hay and return to the gate, the bull had attacked Albrecht, and Danny "saw it throwing his father all around," according to an Iowa County Sheriff's Department report. Unpredictable and lethally powerful, dairy and beef bulls have been killing farmers for centuries. 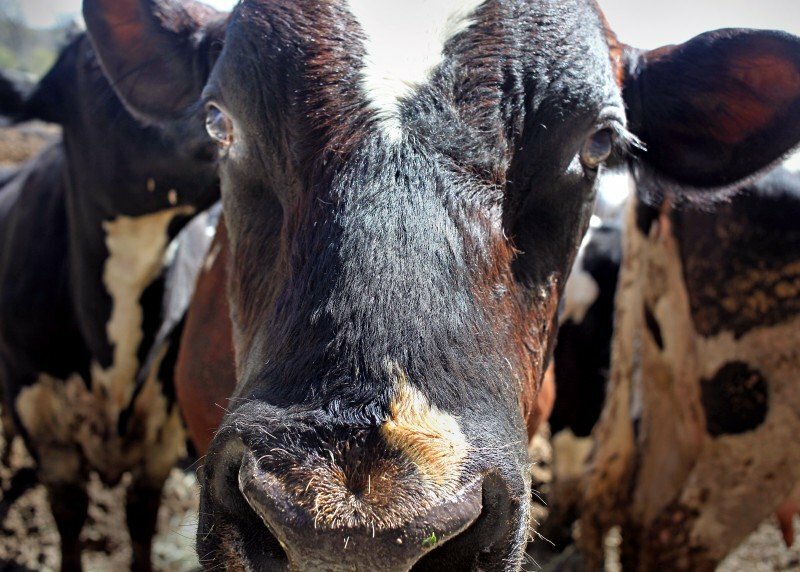 Since 2000, bulls have killed at least 19 people in Wisconsin, according to a report by UW-Madison agriculture safety expert Cheryl Skjolaas. No other kind of animal has killed more than four people in the state during that span, the report said. A three-year study completed at Purdue University in 2009 analyzed 287 bull-related incidents and indicated that the risk of a bull-related death, based on the hours of exposure, "appears to be higher than other known farm hazards such as tractor operation." The study also showed that most of the victims had considerable experience handling bulls. Farmers keep bulls around for breeding purposes even though artificial insemination is safer and costs about the same, according to a North Carolina State cost comparison study done by M. Todd See. Data from the National Association of Animal Breeders shows that the percentage of bovine pregnancies by artificial insemination vs. natural breeding has stayed the same for over 30 years, according to Gary Fassett, a vice president at Accelerated Genetics in Baraboo. "Much to our dismay," said Fassett, "it has stayed at about 65 to 70 percent. That means 30 to 35 percent of the calves are from natural service." Paoli farmer Dennis Himsel's father used artificial insemination with his cows. Himsel, who has been farming for 40 years, carried on that tradition until five years ago when breeding problems with his Ayrshires led him to buy two bulls. Himsel got tangled up with the first bull but was not seriously injured. The bull went to the slaughterhouse the next day. Until recently, Verona farmer Curt Herfel, 67, bred with bulls. He had done so for more than 50 years because he said it was simpler than artificial insemination, which requires calling a technician and making appointments. But that all changed after Herfel was mauled by a bull 13 months ago. Hip surgery had kept Herfel away from his dairy operation, and his enthusiasm got the best of him on his first day back when he walked into a pen and forgot to locate a bull that was standing nearby. Within seconds, the 2-year-old Holstein bull rammed its head into Herfel's side with such force that he was lofted 25 feet into the air. The bull, which sent to slaughter the next day, eventually pinned a crippled Herfel against a feeder and was closing in on crushing him when his daughter, Shelly Johnson, heard the commotion from the barn and dashed out to pull the bull away. Herfel was hospitalized with eight broken ribs, two broken vertebrae and a femur that was smashed into more than a dozen pieces. He didn't walk for six months. He also knew he was extremely lucky. "It took awhile, but everything healed back together pretty well," Herfel said. "It could have been much worse." Skjolaas said the first foreign worker was killed by a bull in Wisconsin in 2010, and it highlighted the need for better education of farm workers who are around dangerous animals. "You look at the question of whether that employee was properly trained. One problem could be language, another problem is whether you have proper policies for discipline," Skjolaas said, adding that the worker reportedly teased the bull. Skjolaas grew up on a farm near Stoughton and once hid from an attacking bull in a hay wagon. "He stood there just rocking the wagon," she said. "I spent an hour and a half in there waiting (for help) because he wasn't losing interest." Skjolaas added that bulls need to be kept in sturdy pens, and handlers shouldn't work alone or play with them. She also said farmers shouldn't keep older bulls. "Once they are 2 years of age, the recommendation is to not have them anymore," she added. "Then they are a little more aggressive." Finally, Skjolaas said everyone needs to be aware of the potential that a bull might be near them. She told the story of a fly fisherman getting permission from a farmer to fish his stream only to find out that he was being watched by a bull. The fisherman escaped with his life. Once a bull attacks, it won't stop unless somebody pulls it away or the victim is dead. Skjolaas told a story about how an emergency medical technician reacted to finding the body of a farmer who had every bone in his body broken by a bull. "She said she had seen many gory accidents on the Interstate, but she never saw a body as severely injured as one she saw killed by a bull," Skjolaas said. Herfel, who wore a neck brace for 14 weeks after his bull attack, knows the scenario. That's why bulls are out of his life forever. "It's like driving your car," he said. "All it takes is a two-second mistake. You can die that quick."